The Legiolert Test delivers quantified culture results for Legionella pneumophila in 7 days. Legiolert uses a highly accurate bacterial enzyme technology in a liquid growth medium to detect all serogroups of L. pneumophila. Cut your wait time by 50% and identify “hot” towers faster. Lower shipping costs with smaller sample requirements. Focus prevention on the most dangerous bacteria, pneumophila. 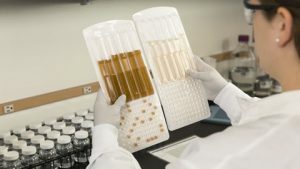 The Legiolert test detects Legionella pneumophila in water samples. This is a culture test based on a bacterial enzyme detection technology that signals the presence of Legionella pneumophila through a substrate present in the Legiolert reagent. Legionella pneumophila cells grow rapidly and reproduce using the rich supply of amino acids, vitamins and other nutrients present in the Legiolert reagent. Actively growing strains of Legionella pneumophila consume the substrate and produce a brown color indicator. The Legiolert test detects Legionella pneumophila at one organism in 100 mL with 7 days. The detection limit for potable water is >10 MPN/100 mL and non-potable water is >1,000 MPN/100 mL. Serotyping can also be performed.